Sue and I have played “ambassador to the United States” these last three weeks, with the happy arrival of some of her family from Italy. Uncle, Aunt, and their nineteen year old daughter Angela arrived for a brief visit in early January along with Angela’s fiancée Franco, who has never been to the States before. The icy blast of the alarm clock jostled most of us out of our beds this morning. The browning Christmas tree that we worked so hard to make just right is (hopefully) at the Foxboro compost heap waiting to become so much chipper fodder. The holiday lights are put away. New Year’s hangovers have hopefully subsided. Normal life has returned. For the past few weeks it’s been back to school, back to work, and for those of us who worked during holiday weeks, back to more formal attire. Note: I’d been writing for the Reporter for only a year or so when I wrote this one — keeping the New England Patriots in Foxboro was BIG news back then. And this, my open letter to Mr. Bob Kraft, was very well received by folks in town. To this day (2014) I am so grateful that the Patriots call Foxboro home, and all that the Kraft family has done for our town. Over twenty years ago, Mom, Theresa and I would make our annual Christmas shopping trip into Boston an extremely enjoyable day. “…A DANGEROUS “gun show loophole” continues to allow criminals and terrorists to legally buy and sell guns in the United States on a cash-and-carry, no-questions-asked basis. “Firearm and Custom Knife Show/Sale!” Against a silhouette of a gun were the words, “350 Tables! As part of the 30th anniversary celebration of Star Trek, Paramount Pictures has just released the eighth Star Trek motion picture and the second to feature the cast of “Star Trek: The Next Generation.” (ST:TNG). 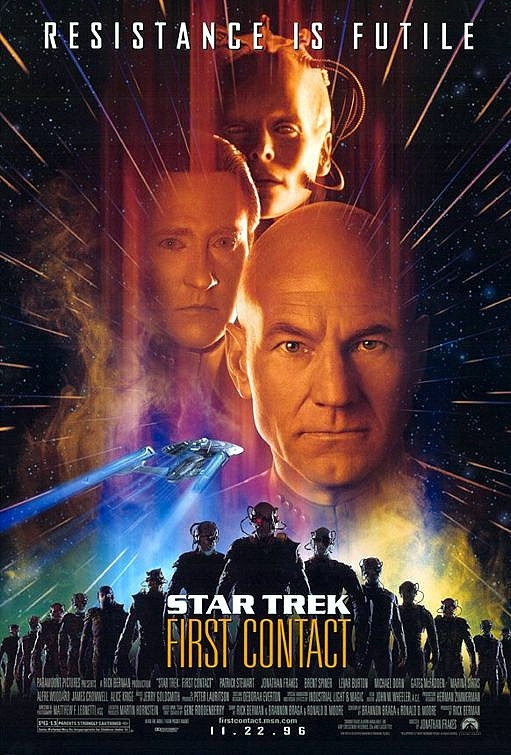 The movie is “Star Trek: First Contact,” and it stands on its own as one of the best Star Trek movies in the series. One of the best movies in recent memory to depict our nation’s chief executive was, “The American President,” starring Michael Douglas. Andrew Shepherd, the widower president Douglas portrays, enjoys the highest popularity poll in decades; he is a wise, strong, compassionate, and fair. A great leader. Shepherd’s only weakness (at least to his advisors) is his reluctance to attack Senator Bob Rumsford (Richard Dreyfuss), his opponent in the next election. MEMORY LANE! THIS WAS MY FIRST COLUMN ABOUT THE FOXBORO JAYCEES HAUNTED HOUSE! We are one dozen brave souls, walking through the dark passages, stumbling through the shadows. Unseen dogs bark at us as we cross a shaky bridge. Huge spiders grab at us as we make our way through cobwebs and fog. Rats squeak angrily as we slowly walk by them. In the distance, a train whistle shrieks. A few years back, I gave Mom a videocassette containing a montage of over sixty family photographs set to music. The video began with a picture of Mom holding me as a baby, and then pictures of my sister Theresa as a baby three years later. As music by Tom Jones and Reba McEntire (Mom’s favorites) played, the video faded from one picture to the next, and Theresa and I magically grew up over thirty years. The cellar was piled with things my father had discarded, but just couldn’t bear to throw away. 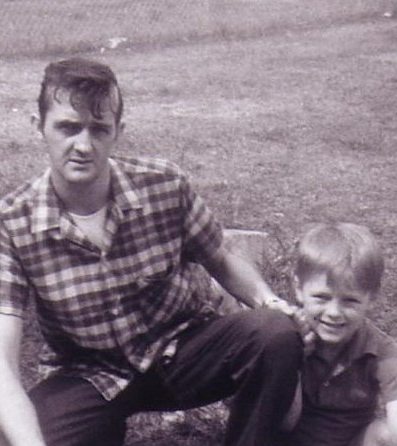 Dad’s anniversary was last week, and once again I pause to reflect on how different my life is without. 12 years have passed since he lost his terrible battle with cancer. And as I grew older I find myself missing him. For some reason, it was here in my grandmother’s house, particularly in this cellar, that I remember him most. It’s no secret to anyone who knows me that I have a great affection for seniors. Taking care of Nana for so many years and listening to her talk about her amazing life made a positive difference in my life. Nearly 3 years after her death, I find myself thinking about her often, and missing our talks. Many other seniors – my mom’s mother, aunt’s and friends – have touched my life and made it a happier place to be. Historians note: I include this here to be complete; this was one of my very first columns for the paper and this is REALLY not very good. Olympic sponsorship is very necessary to make the games possible. It does get annoying course, but it’s all part of the process. That said, all these years later, I just have to file this one away as, “Well, I guess it qualifies as an “op-ed!” This one really isn’t very good!